It’s that time of year again, holiday parties, decorating, shopping, family activities and lots of food and drinks! While it’s an exciting, joyful time of year, it goes as quickly as it comes and can leave us feeling a few extra pounds heavier and absolutely exhausted. But this year, do what you can to have a healthier holiday season so that you’re less stressed and more in control when the New Year begins! Though this is the busiest time of the year at shopping centers across the country, try to avoid the stress as much as you can with online shopping. The crowds, long lines and hectic energy can you leave you feeling more stressed than ever. It’s okay if your entire house is not decorated yet. Take your time and get a little done each day. Invite family over to help and make it a fun get together, if you need to. If you’re older, don’t get up on the ladder without assistance – even better, ask your kids or grandkids to come over and help out. Who doesn’t love the delicious foods and desserts that come with the holidays? While it’s okay to indulge a little and have some fun, don’t overdo it completely. Still put aside some time each day to go for a walk or hit the treadmill. It will help energize you for the day and keep the extra pounds at bay! Also, make sure you’re still taking your vitamins and eating fruits and vegetables each day. Don’t load up on sweets or high calorie foods without the nutrition! The holidays can tempt us to indulge in alcoholic beverages we may not normally consume. Have fun and enjoy your friends and family, but limit your consumption. Especially if you’re taking prescription medication. It’s also important to keep an eye on your elderly family members so they aren’t overdoing it either! 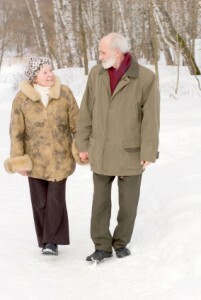 People dream about a White Christmas, but this beautiful time of year can also be dangerous for older adults. Check sidewalks and outdoor steps for ice, and use care while shovelling. Ask for help or consider a service to help keep outdoor paths safe and clear. What are some other strategies for maintaining your health during the holidays? Tell us on our Facebook page!